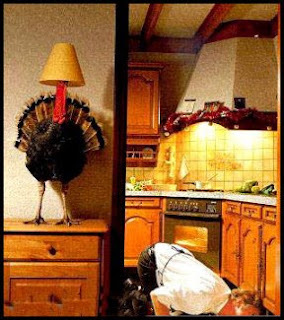 Tomorrow is December 1 already, and we still have some Thanksgiving leftovers hidden in the back of the refrigerator. Because Thanksgiving Day fell late in November, we have less time to get things ready for Christmas. We still have time so there's no need to panic yet...right? The outside lights are all finished, and the family room Christmas tree is up. It has lights and a few ornaments and will be finished soon. Tomorrow I'll put the blue t ree up in the dining room. Yesterday we went downtown to the Indiana State Museum to listen to a Christmas concert given by the Circle City Ringers. I love listening to handbell music. My son has several hand bell pieces being published by Beckenhorst Press. The Circle City Ringers played Wizards in Winter by the Trans-Siberian Orchestra. You can hear it on my playlist in the side bar. I think any group that even attempts that piece is awesome. The museum is all decorated for Christmas, too. This is Santa's mailbox. This was just a nice spot where you could sit and enjoy the Christmas tree and listen to the sounds of Christmas. There might be some time tomorrow for some stitching while I regroup. I hope so because I'm about to finish up another big project. Have a good evening. Tomorrow is Thanksgiving Day, and the preparations have begun. I had hoped to post some pictures of some of the finished dishes today, but so far there is nothing to photograph. That's because there are no finished dishes yet. Here's why. We celebrate our Thanksgiving on Friday because we combine eating turkey and all the trimmings with decorating the outside of the house for Christmas. That is the way we've done it for as long as I can remember. Today my daughter and I did a few of the Thanksgiving preparations ahead. And, what did we do the rest of the day? We went out and bought more Christmas lights to put outside. I also bought a new food processor in hopes that will cut my kitchen duties in half. Ok. I can dream, can't I? So tomorrow we will prepare everything else on our list up to the point of the final cooking. Here is how I do my mashed potatoes. I make this the day ahead of Thanksgiving and put it in a microwave safe bowl that I can serve from. I just pulled this off the internet a few years ago, and I think it is a keeper. Peel potatoes and bring to a boil on high heat on stove. Reduce to medium low and cook for 15 minutes. Drain and beat with mixer. Add sour cream, cream cheese and milk and mash. Cover with plastic wrap and refrigerate. Before serving, vent plastic wrap by piercing with a fork. Microwave on HIGH for 6 - 8 minutes before serving. Then stir and microwave uncovered an additional 2 - 3 minutes. This is easier than beating the potatoes right before dinner, and the mess is already cleaned up. I've also posted the NANOWRIMO novel award winner symbol on my side bar. That just means that I've written the required number (50,000) words. Actually I've written 65,224 and my story isn't finished yet. There is no real prize except for the satisfaction that you have written something that resembles a novel. This was a really fun experience. I don't think it is anything that anyone would want to read. In fact, if they did I'd have to leave the country and take an assumed name. 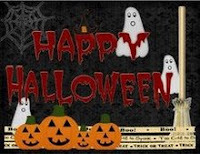 But, it was fun making an outline and writing a story and I will probably do it again next November. The big blue tree next door to the Blue Gate Restaurant. The Blue Gate at night. Inside the Blue Gate waiting to be seated. Christmas display at the Craft Barn. The corner opposite the Blue Gate. Christmas display inside of Yoders. The sitting area outside of the Conference Room where we sew. Edyta Sytar speaking to our group on Friday evening. One of many quilts that she showed during her lecture. This was a Christmas display at the Blue Gate that just fascinated me. The glass container has greenery and white Christmas lights inside that were blinking on and off. They had some red shiny decorations mixed in, and it was eye catching. Somehow I've got it in my head that I'm going to make one of these. But, I'm a bit stuck on the part where I have to put a hole in the glass container to put the lights in. After really giving it some thought, I would probably have been just as far ahead to have just bought the one in the photo. More on that later on if I decide to try it. Now to go to the grocery to get some things for Thanksgiving Dinner. I arrived in Shipshewana, Indiana, on Thursday afternoon. 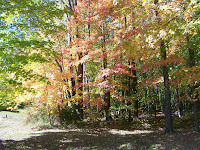 My friend Pam, also of Indy, drives to the fall retreat. That was a no brainer because her car has heated seats. It is snowing today. There isn't much sticking, but the flurries are near white out at times. We are having a good time shopping, buying fabric and yarn, and eating at the Blue Gate restaurant. For those of you that have never been there, they have 34 different kinds of pie. There is so much pie and so little time. You can see that there is a bit of snow left on the ground that fell before we arrived. The town is decorated for Christmas. The buildings and trees are lit at night, and there are Christmas trees and decorations everywhere. This is the little yarn shop here in town. And, one of the nice things about this retreat is that Jeanne from Luv2Stitch and Gayle from Sentimental Stitches are both here at the retreat. You can link to their blogs at the right. Now I have to get back to the sewing room so I get something done today. More tomorrow. I've had a busy few days. I've been writing but just not on my blog. My son has me involved in something we call NANOWRIMO which stands for National Novel Writing Month. The idea in a nutshell is that we start at midnight on November 1 (or sometime thereafter), and we write a novel. Our goal is to get to 50,000 words written by the end of the month of November. It doesn't have to be a masterpiece, and noone will ever read it if you don't want them to. The idea is just to write. I am a little over 32,000 words, and I started my novel a week ago today. My daughter-in-law and daughter are also writing this month. We've been challenging each other, and giving each other ideas, and it's been a lot of fun. Anyone can participate so if you want to jump in now and write, go to http://www.nanowrimo.org/ , sign up, and start writing. 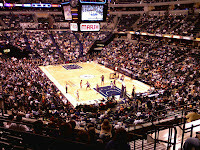 Last Wednesday, Bill was given the corporate tickets to attend the Indiana Pacer game at Conseco Fieldhouse. We sat in the Legends Bar/Restaurant area that is located on the level where all the suites are. We got to see the Pacers play the Phoenix Suns, and this was the only visit to town for Shaquille O'Neal. He's 36 and while that doesn't seem old, it is in basketball player years. I was thrilled to get to see him play. That was a nice evening and quite a bit of fun. 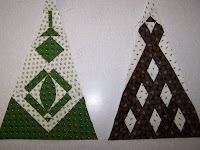 I have also sewn a couple more Dear Jane triangles. 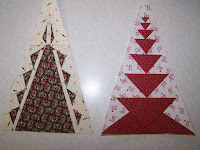 Today, I plan to sew a couple more DJ triangles and work more on my story. I have been trying to figure out a way to do both at the same time. I brought some hand sewing here and sat at the computer yesterday, but that was a tiny bit counter productive. Have a wonderful weekend all!!! It's been awhile since I've posted. My computer has been a slow poke lately because I have too many good things (???) loaded on my C drive. Then my printer woundn't work and then my computer wouldn't download my photos. So now it appears like everything is working at least for today. I've finished another Nearly Insane block. I have such warm feelings everytime I look at these blocks. In the two corner opposing squares of this block are fabric hexagons that belonged to my Grandma. She lived from 1888-1980. 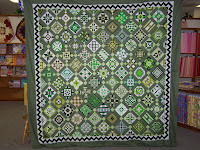 If you will notice the quilt that I used in the photo on my blog banner, it is the one that my Grandma made for me. She never owned a sewing machine or didn't have any of those paper templates. 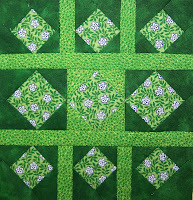 She cut pieces from her house dresses or used whatever she could find to make her quilts. Somehow after she passed I was given her leftover box of hexagons. Her cardboard template is still in the box. 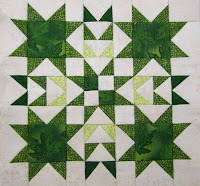 I have used several of her green hexagons in my quilt. I also have fabrics from Norway, Canada and several different states. When we attended the last Dear Jane retreat in Shipshewana, people noticed that I was doing my Nearly Insane in greens and lots of them gave me pieces or even let me cut a piece from what they had just purchased. Several friends here in Indy have given me fabrics, too. So this quilt may not be the most beautiful but it will have many fond memories. I've also done a little bit of shopping. Civil War fabrics, but the batik was something I bought just because and it was one of those, "Oh just give me the rest of the bolt" purchases. It is called autumn and I couldn't leave just a little sliver sitting in the store. 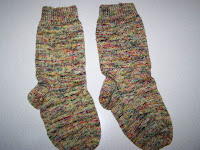 Speaking of stitching, Hanne is having a giveaway over on her blog. 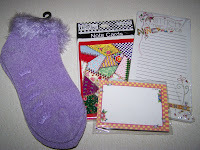 She has designed two wonderful stocking patterns with stitchery around the top. Go on over there and have a look. Hope you are having a good day and that you are getting lots of stitching done. 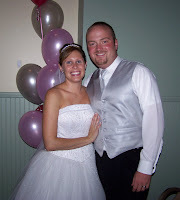 Yesterday afternoon we went to my niece's wedding. She made a beautiful bride, and her dress was amazing. I think they make a handsome couple. 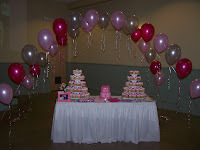 Here is a photo of the cake...cupcakes instead of a large cake. All of the children in attendance loved this!!!! Before we left for the wedding, I managed to get one more Nearly Insane block finished. It is really hard to go to a yarn store, look and touch, and not buy something. This is my "catch" from a couple days ago. I don't know what the plan for this yarn is yet. I'm sure I'll find something. Here is the latest Nearly Insane block. Not a lot of progress on the NI blocks because I'm painting my daughter's bedroom so I can move my sewing area in there. My thought is that if I can spread out and have more room, I will be more organized. I will keep repeating that to myself until I really believe it. 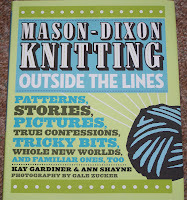 This past week I spent time having lunch with friends, shopping, going to quilt bee, shopping.... A friend told me that she picked up the new Mason-Dixon knitting book at Barnes and Noble so I hurried on over to pick up my copy. I didn't think the book was to hit the shelves until September 16. This book is just as wonderful as their first. 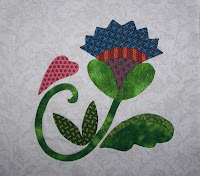 I have finished a few more of my Nearly Insane blocks, and I have also have finished one of the Elegant Garden applique blocks by Laundry Basket Quilts. 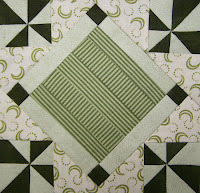 I love these blocks and have discovered that it probably takes me as much time, if not more, to prep the blocks and choose fabrics than it does to do the applique. 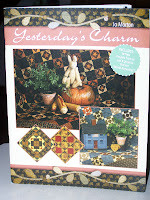 Either way I love their designs and love to applique. Also, I am a Starbucks coffee fan. Well, really I will drink anything that even closely resembles coffee. But, Starbucks is my favorite and has come out with pumpkin spice lattes for the fall season. So what could be better than having a new knitting book and a pumpkin spice latte? Do you remember when your Mom would ask, "Now if everyone jumped off a bridge, would you jump in after them?" My Mom is no longer here to ask me that question, and I guess I somehow forgot the answer. This is a picture of my Christmas Signature block from the swap that I signed up for over on the DJ Alternate List. That list is a sub group of the original Dear Jane list, and lately they have turned to swapping blocks for anything and everything. I signed up for the regular signature swap earlier in the year because I wanted a signature quilt for the year that I finished my Dear Jane quilt. No, it isn't finished yet but all the blocks are done and I have 3 triangles finished. 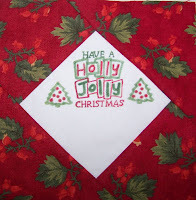 The Christmas Siggy swap is the first ever, and I thought I should get in on the ground floor so I would have a quilt from the very first Christmas swap. The swap Mom posted a database where you could sign up, and when I signed up halfway through the month, I was number 55. Piece of cake. 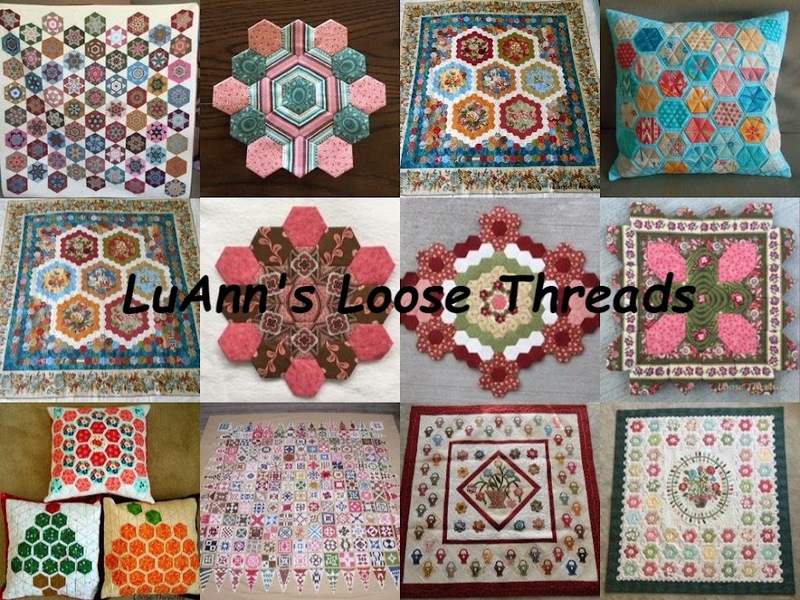 We have until September 30 to get all sewn, colored, and mailed. By the time all was said and done at the end of the month, 160 people had signed up for this swap and we needed to send in 5 extra "just in case". 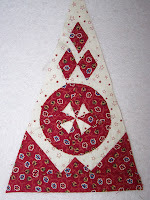 I had already bought my fabric for the triangles and stamped the center piece of muslin so there was no turning back. I have them all finished except for a bit of heat setting with my iron, and then they will go in the mail. I will not sign up for any more swaps!! 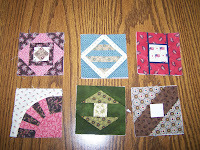 Well, there is this other swap I'm in with cute little 3 inch blocks, but that will be for another post. These scarves were yesterday's project. 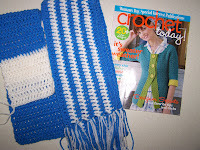 I saw this Crochet Today magazine and bought it because of an afghan pattern. But, before I got to the pattern, I saw a nice article about a program to stitch a scarf for each participant in the 2009 Special Olympics. You have to use Red Heart yarn in Delft Blue and Soft White so I went on the hunt and couldn't find the yarn. I finally gave up and mail ordered 2 skeins of each color. 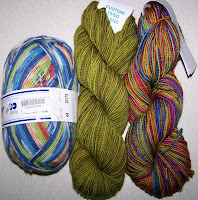 By this time, a friend had found it in one of our local craft stores so I bought a couple more skeins. I told my husband last night that I should give up knitting. I thought he feinted there for a second because apparently he has some idea of how much yarn there is upstairs. I just meant that I've crocheted much longer than I've been knitting and could work it up faster that way. I've been in Huntsville, AL, visiting our daughter for the long weekend. 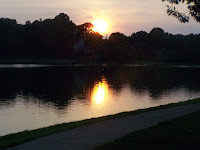 Here is a photo of the sunset over Lady Anne Lake. Her apartment is located right on the lake and every evening we are there, we go out and watch the sun set on another day. Here are a couple photos of my Nearly Insane blocks. 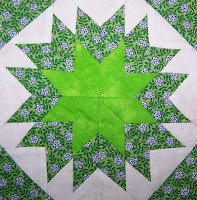 The green floral fabric came from Hanne in Norway. We met at a Dear Jane retreat earlier in the year.